CONTESTS: make sure you don’t miss the youth contests this year. 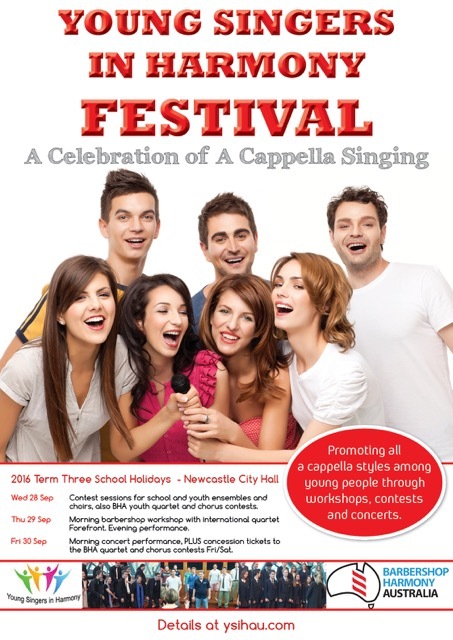 The very entertaining youth and schools contests are on Wednesday 28 September at the main convention venue, Newcastle City Hall. HELP NEEDED: we are hoping to have a good number of ensembles from surrounding areas in New South Wales. Members in these areas are particularly invited to spread the work regarding the Youth Festival. A separate poster is available at the Young Singers In Harmony Festival website www.ysihau.com and can be downloaded and forwarded to music teachers and others. YOUTH SHOWCASE CONCERT: another will be the Youth Showcase Concert on Friday at 9.00am-10.30am. It will be a real treat with the best of the youth performances. Plan to be there to support our young performers.